I’m coming out of lurker to status to let you know I made this for dinner tonight. I’m visiting my parents and they were impressed I could throw a delicious dish together out of stuff they had in the fridge. Thanks for helping me appear to be a competent adult! I wish people would realize that you really NEVER need to compensate for a dish being vegetarian. the veggies will speak for themselves! Arrgh. Pet peeve. Anyway. I love it when I read the title of a dish or see a picture and then take matters into my own hands about what goes into it. It’s almost like a game of telephone and it’s so fun to see how different the two end up in the end. 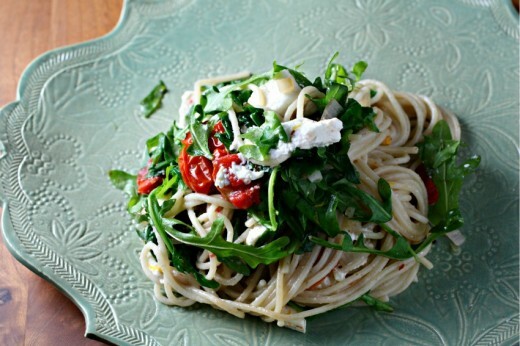 Love the fresh flavors in this pasta! It reminds me that I need to gather some arugula seeds for my little garden plot!!!!!! I spent 2 days in Seartle over the weekend and it was a riot of colour!!!! This sounds simply lovely. The parts all go together so well, and who can resist roasted cherry tomatoes? I’ll be craving this all day. Ah, yes. Your description of the sometimes perfect dish (without the whiz! bang! pop!) so reminded me of Spinasse’s buttery pasta. I remember you recommended it to me right before I moved to Seattle and Sam and I went on our anniversary and it was one of the best things I’ve eaten in many, many months. So yes, simple usually reigns. 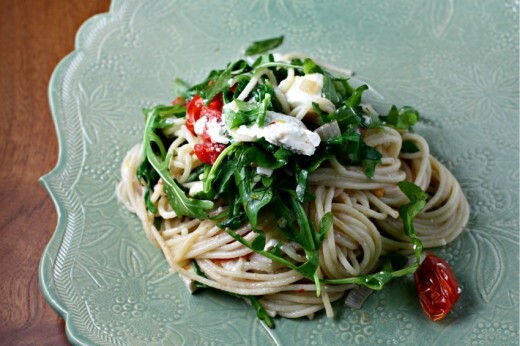 I love the looks of this pasta, too (arugula + feta = win). Happy weekend, friend.